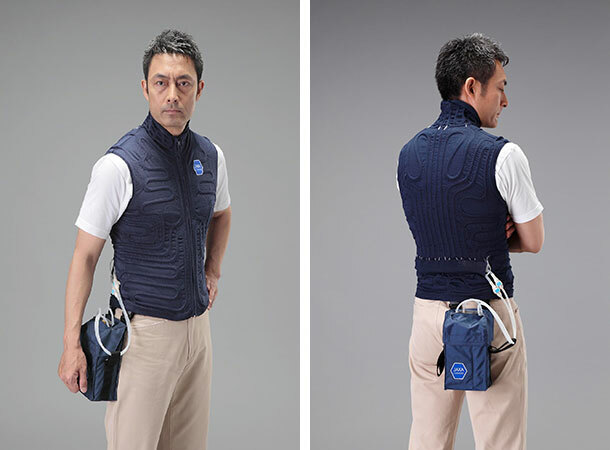 The Public Interest Incorporated Foundation Nippon Uniform Center (Minato-ku, Tokyo, President & CEO Junji Morita) developed a cooling vest in cooperation with TEIKOKU SEN-I Co., LTD. (Chuou-ku, Tokyo, President & COO Tsuyoshi Shiraiwa) and other parties. The product will be on sale under the "JAXACOSMODE" brand (JAXA space brand). We plan a limited distribution of 1,000 vests beginning on May 30 from TEIKOKU SEN-I Co., LTD for this fiscal year. The Japan Aerospace Exploration Agency (JAXA) integrates domestic technologies of cutting-edge materials, sewing, clothing facilities, precision processing and other related industries, which are Japan's field of expertise, and promotes "Study on the Next Generation Advanced Space Suit" as an element technology research for an extravehicular suit that exceeds that of other countries. The next-generation space suit must be accommodated to the harsh space environment so as the temperature control inside of the sealed suit, which shall be cooled down due to the heat increase by astronauts' generation of heat. The cooling vest underwear for a space suit is designed to effectively cool down the body of an astronaut by carefully designing the length, number and routing route of a cooling tube. A new method of tightly attaching the skin and the underwear is also adopted to absorb sweat and evaporate it immediately so that no stickiness remains to secure comfort. Nippon Uniform Center began participating in this next-generation leading-edge space suit research in 2008 to support the development of the cooling vest by providing uniform research knowhow such as pattern design and sewing technology. Sales release of this cooling vest is an application of the next-generation leading-edge space suit research. The proposal titled "Study and Renovation of Cooling Underwear for Space Use for Commercial Use" by Nippon Uniform Center was selected as a business proposal at the JAXA Open Laboratory Public Tender, and it was first started as a research and development project for specifications to apply it to the fire-fighting field. The cooling vest system consists of a vest with tube routing around it and a pump unit that circulates coolant. Water that is cooled by ice inside the tank is sent into the tube by the pump to run through the vest. By circulating coolant in the tube attached to the vest, human body will be cooled down. Therefore, it is expected to be utilized for measures against heat strokes. The details of the vest to go on sale are as follows. JAXA COSMODE brand product born through collaboration with JAXA. Useful for measures against heat strokes under the scorching heat environment. Coolant of around 4 degrees Celsius is running around the underwear vest to keep the upper body comfortable. It works for about 30 minutes with one liter of water in the coolant tank. The underwear is soft and stretches. It has a germ-control and soil-resistant finish, and is machine-washable. The temperature difference between with- (33.0 deg. C) and without- (39.7 deg. C) the vest was 6.7 degrees Celsius. The person with the vest hence was much less tired. Test environment: 35 to 36 degrees Celsius with humidity of 70%, typical mid-summer conditions in Japan (solar radiation was simulated). The test was held by wearing a highly airtight chemical protective suit. A collaborative system through the invitation of public participation that aims at promoting the expansion of the aerospace field by achieving innovation that has some social and industrial impact with the participation of domestic private companies and universities. "JAXA COSMODE" is a brand designed to introduce the features of space to our lives on the ground. The JAXA COSMODE logo is given to a product that is born through collaboration with JAXA by utilizing cutting-edge technologies of JAXA R&D or results of cooperative research with JAXA.